And … we return to the BBC series, Back In Time For Dinner. I posted about the 1950s and 1960s, the 1970s, and the 1980s. Here are the 1990s. Consumers were time-starved. Both men and women were working long hours away from home. Recall that women had entered the workforce in droves by the mid-1970s, so home-cooked meals from fresh ingredients were vanishing. Britons may have been time-starved, but they weren’t food-starved. Manufacturers saw the growing market for prepared food and responded with more industrially-produced (ground beef), prepackaged (cereal bars), and chilled meals that didn’t need to be defrosted. Where did consumers buy all this prepared food? At massive superstores that were opening on the outskirts of cities and towns. The selection, compared to decades prior, was staggering, e.g. whole aisles were devoted to just one item, like water. Asian and Indian influences were now entrenched, in restaurants, in food markets, and in the home. And all this food was cheap, relative to years past. It was in the 1990s that consumers started to take inexpensive and plentiful food for granted. Home-cooked meals were vanishing and so was a sit-down breakfast. Giles said that “today, over 40% of us grab breakfast on the way to work,” and “by the end of the 1990s, 30% of our spending on food and drink was outside the home.” Those eating establishments were becoming more informal – large, open rooms with big windows to the street outside, no curtains, no tablecloths, more rustic furnishings. Britons had started to experience weight problems in the 1980s. It was getting worse in the 1990s. There was another trend brewing, almost 180 degrees from the one I just described. It started in the 1960 with the Macrobiotic movement, when newly empowered youth began rejecting the influx of processed food. They moved onto small, communal, organic farms and cooked with novel ingredients such as brown rice, millet, and miso. They raised and milked their own goats. Come the 1990s and the UK’s mad cow scare, organic farming took off, as did vegetarianism. Sales of beef fell 90% (although recovered). People were waking up to how their food was produced, to factory farming methods (that contributed to mad cow) and to the 1990s’ profusion of pesticides and synthetic fertilizers. Those who could afford the time and money (organic food was sold at a premium) returned to home cooking, but now, against the backdrop of 1950s austerity and necessity, it was recreational. 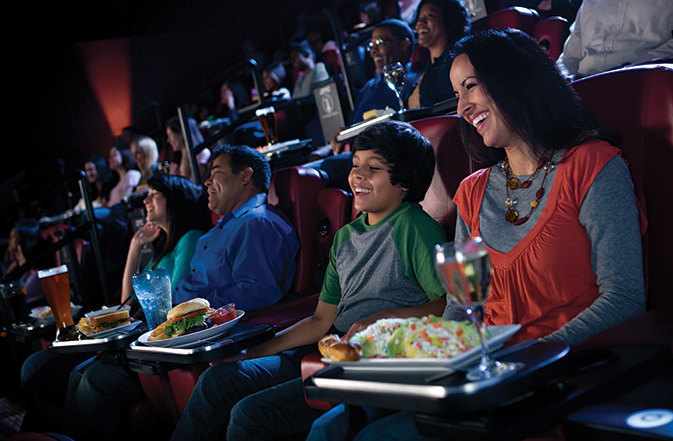 Customers can recline in their seats and enjoy food and drink from a casual menu while watching their flicks. Call buttons at every seat. 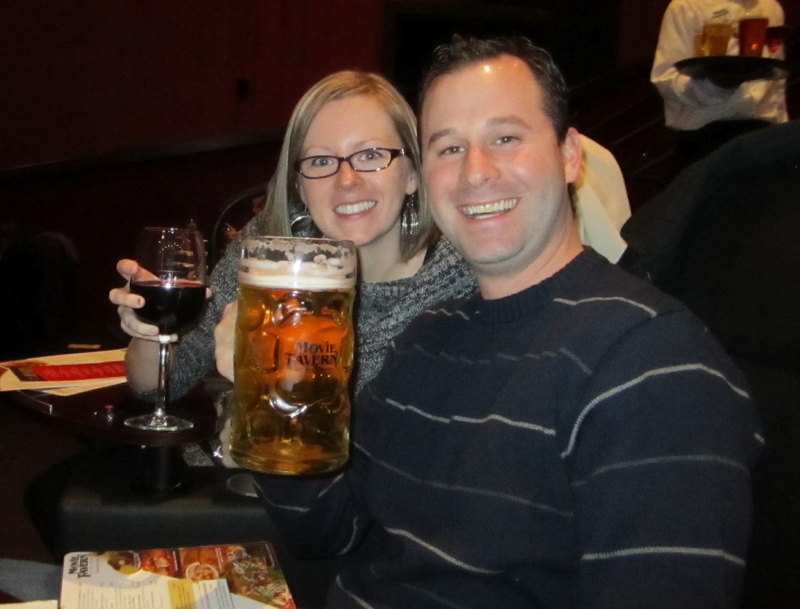 The theater also sells beer, wine, cocktails and mixed drinks. 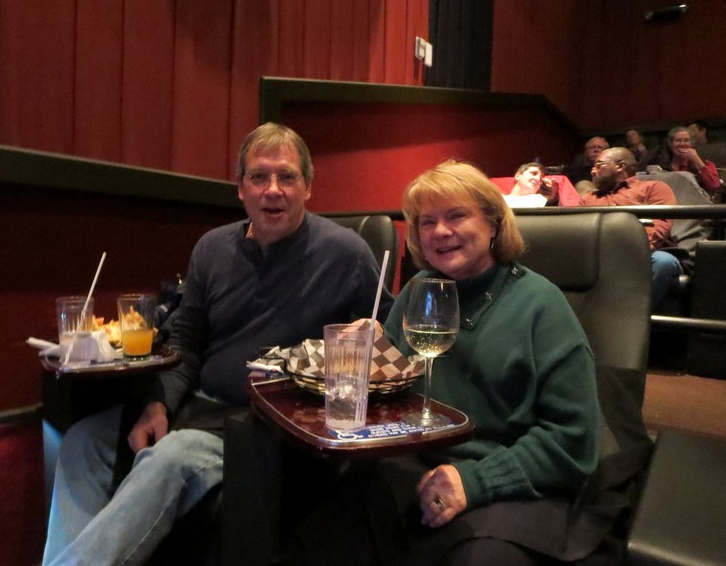 I collected some photos because I had a hard time envisioning how people are served food while watching a movie. I mean, is it still dark? The first three here look like they’re staged, promotional material maybe. From these, it looks like there is some light above them, directed at them. Not a very dark room, is it. I wonder if people have to pass food down the row. Here are some real photos. Interesting that they serve alcohol. I sense these theaters may be noisier than ones I’m used to. Eating like this, not just snacking, seems like an effective way to down calories outside of mealtimes. Or, do you think this replaces a meal? This entry was posted in Uncategorized on April 25, 2015 by Bix. 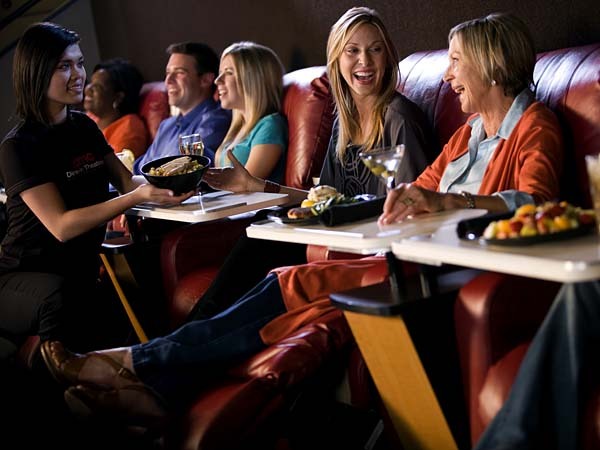 Moreover, while watching a movie, it is disgusting hearing the noise of people eating and drinking! Bad manners are even greater while they eat far away from they are supposed to eat.